This week in the war, the Soviet’s 3rd Guards Tank Army entered Kiev—the Soviet Union’s third largest city. One day later, on 6 November 1943, the city fell to the Soviet Army. 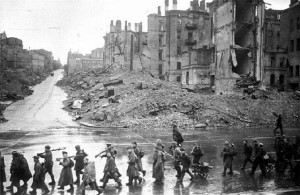 By that time the Germans had withdrawn after destroying many of Kiev’s ancient buildings. Jewish survivors who had been in hiding in Kiev described how tens of thousands of the city’s Jewish citizens had been murdered by the Nazis. This entry was posted in World War II and tagged Kiev. Bookmark the permalink.